I have written a book with the help of the very capable William Patrick. It was a rich experience to look back and try to connect the dots on life, work, how we work as teams, what it means to lead and to follow, what makes us explore and how exploration might make us better. "Steltzner is a genetic cross between Einstein and Elvis Costello who has mastered the art of managing complex tribes of humans. 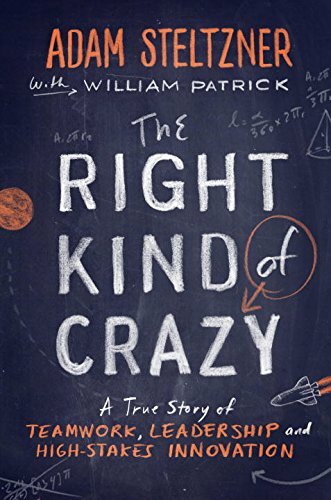 The Right Kind of Crazy is a fabulous--and ongoing--story." "Crazy ideas stay crazy until they become reality. The problem is it takes a lot of people working together to turn crazy into amazing. Adam Steltzner should know--he did it. In this book he shows us that doing what others think is impossible takes more than grit and courage. It takes the ability to inspire people...It takes leadership." "Adam Steltzner not only does great engineering, ho also teaches it and he can lead a great engineering team such as the one that landed Curiosity on Mars. All that embedded in a gaudy personality and astute observes makes for a book that is as delightful as it is instructive." "How does a band of engineers get a 2,000-pound robot to the surface of Mars? The Right Kind of Crazy is proof that with the right kind of leader a team of dreamers can accomplish just about anything"." "This book shares Adam's journey from juvenile delinquent to landing on Mars. In its pages you will enter the mind of a fearless genius rocket scientist and discover the power of intuition, and how creativity and courage are as important as math. It is a must read for scientists and artists alike."